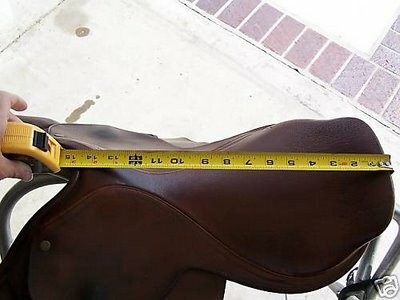 While browsing Ebay for saddles, I came across an auction for a english saddle that the seller claimed to be 15 inches, but it really didn’t look that small in the first picture. So I check out the other pictures and find out that they are measuring the wrong way. When measuring a english saddle it should be from the middle of the cantle to the middle of one of the nailheads on the side of the pommel. 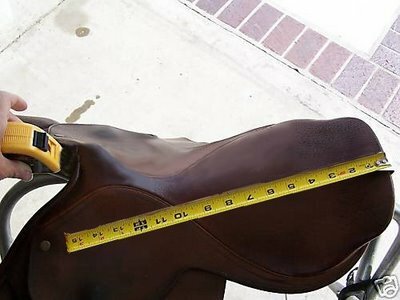 I did a little quick photoshop, and I can guess this saddle is closer to 16.5 inches. That is quite a difference in size! The ruler reaches to about 15.5 inches and if you imagine it reaching to the middle of the nail head, it would be about 16.5 inches.